Pocket Naturalist: Freshwater Fishes, 2002, by James Kavanagh, illustrated by Raymond Leung. Compact, laminated nature guide, profusely illustrated in color. 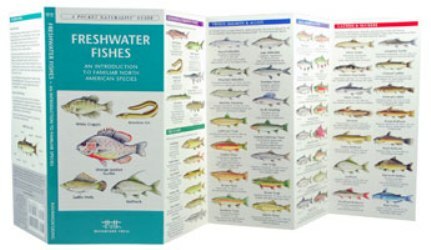 Shows over 120 familiar North American species of freshwater fishes of all types and sizes, with tips on identification. Has ruler along edge for measuring. Folded to 4” x 8 ¼,” opens out to six 4” panels.